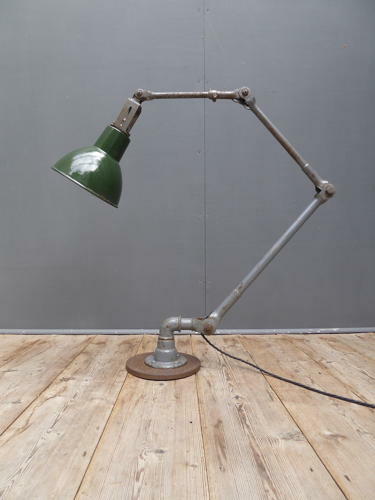 A large early vintage industrial articulated Dugdills work lamp. A fantastic example in original factory grey paint with a contrasting green & white enamel shade and cast iron base. Rewired in twisted black flex with an inlione on / off switch & mounted on a fitting cast iron plate. Wear commensurate with age, good original condition, cosmetically unrestored. The cast iron base can be removed to allow for use as a wall light. Measurement given(cm) is taken in the classic position as per the main image. Electrical items should always be checked and / or installed by a qualified electrician prior to use.